If you think that the distance involved or the timing of the channel crossings mean that you will have too much driving in a day, then put your mind at rest by booking an overnight stop in an en-route hotel. Or why not benefit from an extra day's skiing before and/or after your holiday? Spend Friday night in a hotel close to your resort and enjoy a full day on the slopes before checking into your accommodation on Saturday afternoon. We can suggest convenient locations, such as Calais, Lens, Troyes, Dijon… and we will take care of arranging it all for you. You will find below a selection of our most popular locations as an ideal stop over, based on the recommended driving route to either the French Pyrenees. However, please feel free to request a price for a different location. InterHotel is a chain of independent, privately owned and affordable 2-3 star hotels. As there are 300 InterHotels across France, we cannot show them all here. Hotels are divided into 15 categories A-O. The majority of hotels fall into A-D.
Prices are per room per night, including breakfast. Local tourist tax is payable on-site (max €1/pers). 1 child under 12 stays FREE when sharing with 2 adults. Meals for children staying free are payable locally. This French hotel chain (part of world leading hotel chain Accor) features standardised 4*** hotels. It guarantees comfort along with high standard facilities. We have selected 3 towns for an ideal stop-over en-route to the slopes: Reims, Dijon Sud and Lyon Bron Eurexpo. ** - Prices until 31/03/16. Prices are per person per night, including breakfast. Local tourist tax is payable on-site (max €1/pers). 2 children under 16 stay FREE when sharing with 2 adults. *Price differs for April. For both InterHotel and Novotel: Please note reservations cannot be held after 18.00. If you plan to arrive after this time, you must contact the hotel directly well in advance to confirm your arrival. The address and telephone number of the booked hotel will be forwarded to you with your travel documents. The 4 star Golden Tulip Troyes Hotel, has 83 rooms and offers you free and unlimited Wi-Fi internet access and an outdoor swimming pool. 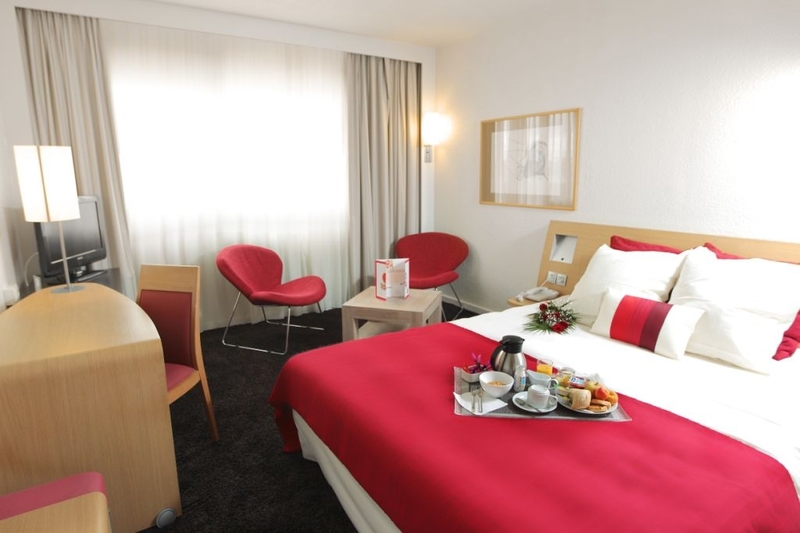 It is the ideal busy area for your leisure stays, just a few minutes away from the medieval and historic town centre of Troyes and from the first European outlet shopping centre. It is also located near to the exit of the A5 and A26 highways. Prices are per person per night including breakfast. Local tourist tax payable on site. 2 children under 12 stay FREE when sharing with 2 adults. Ideally located only a few minutes from Geneva airport, the residence is a great choice for an overnight stay if your flight arrives late and you want to be on the slopes first thing the following day.Free airport shuttle from the airport to the hotel (Monday to Friday 7.00-10.00 am on an hourly basis and from 17.00-22.30 on request). The aparthotel offers 124 spacious, convenient fitted rooms and suites arranged over 5 floors (with lifts). Facilities include a 24/7 reception, air-conditioning and free Wi-Fi throughout the hotel, a breakfast room (breakfast available €12/adult, €6/child aged 4-12yrs) and an outdoor car park. There is a 450m2 spa with swimming pool, steam room and fitness room. The functional rooms all have a double bed or 2 single beds (and some triple rooms with 3 single beds), a private safe, telephone, satellite TV, an ensuite bathroom with bath and hairdryer. Some have an extra kitchenette (with microwave, small fridge, ceramic 2-ring hob and sink). The suites are made of 2 interconnecting bedrooms (one with a double sofa bed and kitchenette and one with either a double bed or 2 singles). * Please note we cannot book the below hotel on 17/1-23/1 & 29/2-3/3. Prices include: bed linen and towels, daily cleaning, toileteries, Wi-Fi, Satelitte TV, undercover parking, access to pool, fitness. Official rating is 4 star, but we would classify as a good 3 star. Buffet Breakfast is €12 per adult and €6 per child 4-12 payable locally. Pets welcome €10/day or €40/week. If you would like to stay close to the Eurotunnel terminal the Holiday Inn Express is the hotel our directors would recommend from personal experience. The hotel is new, good value and it is the closest hotel to the terminal. Further details can be found on our Eurotunnel page. Call us on 0844 576 0176 or email us at reservations@pyreneescollection.co.uk to book your en-route hotel for your French Pyrenees ski holiday!